subtraction using number bonds (we call this the "munching method", and it is our preferred method). It is useful to practise all methods with your children as they will help with future maths skills. Without enough practice and the chance to develop their own preferred methods for subtraction, children can come to rely on crossing out, counting back and number lines too much - especially when bridging 10.
the vocabulary of subtraction: subtract, take away, leaves, makes, equals, is the same as. 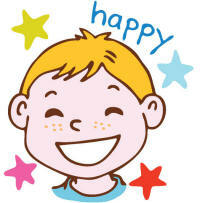 the main subtraction facts from 20 - that is, 20 - 0 = 20, 20 - 1 = 19, 20 - 2 = 18 and so on. 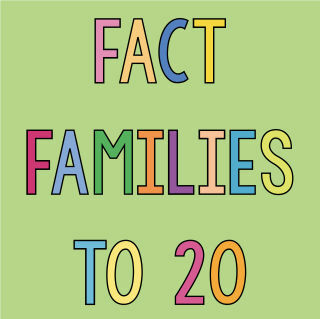 Our Teen Facts Subtraction Poster (with 2 fill in the blank versions) can help with these facts. Using the subtraction by crossing out method first can help children visualise what is meant by subtraction as the physical "crossing out" reinforces the concept of "taking away" or "subtracting", and is a good way to start the kids off, best used when subtracting the smaller number still leaves a number greater than 10. However, while this is fairly quick and easy to do when working within 10, when working within 20 it can lead to a lot of counting! It can therefore be worth adding an extra step using skills the children have already learned such as grouping 5 or 10 cards together, or counting in 2s. Line them up. Grab a pen and paper and draw a line of a number of simple objects - circles, stars etc. Ask your child to count them, then say you want to take some away. Ask your child to "cross out" that number. Now ask your child to count the remainder. Start by revising subtraction within 10 (eg 8 - 3 = 5) and then increase the numbers over 10. Cross them out cards. Use our printable double-sided cross them out cards (in the Resources section below). Put out a row of cards out and count them. Now ask your child to "take away" a certain number by turning them over. Count the remaining pictures. Start by revising subtraction within 10 (eg 9 - 5 = 4) and gradually increase the numbers. Worksheets. We have a variety of Subtraction by Crossing Out worksheets for practice below. Revise skills. Practise counting down from 20, and from any number below 20 (for example, starting from 16). You could "snap challenge" your child by asking them to count backwards from (say) 14 to (say) 8 as quickly as possible, and suggest that they "snap challenge" you too. Use for 1, 2, 3 or 4 but not more. Counting back can be a useful strategy but for larger numbers it can be difficult for children to hold the numbers in their heads. Heads and fingers. Put the first number in your head, and then count down by the number of digits you are taking away. So for 18 - 4 you would put 18 in your head (point to your head and say 18) then count down with 4 fingers ... 17, 16, 15, 14. The answer is 14. Use number lines. Choose a number line, twenty frame or twenty tower from our Resources below. Put your child's finger on the large number and then "hop back" the required number to find the answer. Make it physical. Draw a number line in chalk outdoors. Start your child on the large number and "hop back" to find the answer. Worksheets. 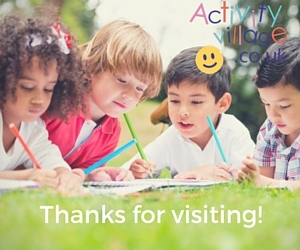 You will find worksheets below which give children practice at subtraction by counting back. When? Use the Munching Method when subtractions will bridge the 10 - for example, 15 - 8 = 7. 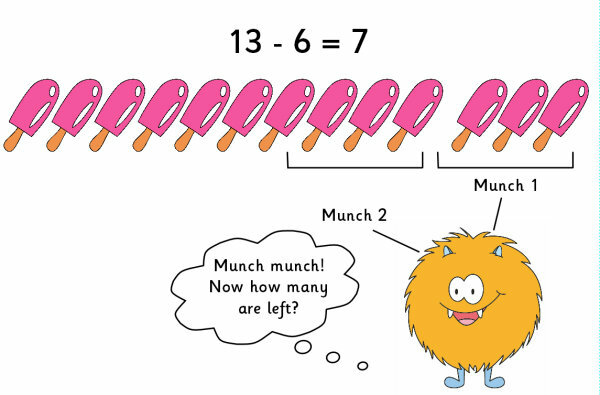 These problems can be hard for children to grasp at first, but we've come up with a way of making it fun using a combination of number bonds that they already know and a munching monster to encourage them. There's an explanation printable and worksheets in the Resources section below, but the gist is that, when a subtraction sum means that the big number is above 10 and the answer is below, it can be easier to tackle the sum in two "bites" using existing knowledge of number bonds to help. Munch! Exaggerating the munching monster will make the learning fun for reluctant kids so make munching noises as you go! Make it real. Find a monster toy (or print, colour and cut out the Munching Monster that we use in our worksheets, in the Resources sectoin below). Gather together 20 similar objects and lay out (say) 13 in a row, with a slight gap after the 10th. Now show how the monster is going to munch twice: first 3 objects, then another 3 objects. Please note that these resources are in alphabetical rather than suggested use order. These fun double-sided cards have been designed to help children understand subtraction by crossing out with some hands-on practice. Practise subtraction within 20 - including sums that bridge 10 - with the help of a number line. There are 2 worksheets in this set. Here are two more worksheets to give children practice at subtracting within 20 using the counting back method. We've included an extra problem for them to think about too. There are 4 worksheets in this set, which give children plenty of practice with subtraction by crossing out - starting with an example and some fun illustrations to keep them interested. Here are two more worksheets giving children plenty of practice at using subtraction by crossing out within 20. On each worksheet we have done the first problem for them to show them how, and provide 9 more for them to do themselves. The "munching method" of subtraction is perfect for when sums bridge the 10 - for example, 16 - 8 = 8. This can be very tricky for children to grasp, but of course it is a skill which they will be called on to use often in adult life. Bring the Munching Method to life with your very own Munching Monster to help you do your sums! Children can colour him in and cut him out. Laminate if possible, if you think he might be used often. Do some "real life" Munching Method practice by collecting together up to 18 small objects and letting the Munching Monster work out the answers to some subtraction problems! Subtraction that bridges 10 is a tricky skill for kids to master, but it can be fun if you use our munching method! Here is a set of 4 worksheets to get kids started.